Another star of our friend's roast was the vegan Yorkshire puddings. They had a breakthrough with this one! Not only did they taste like the real deal, they even looked like Yorkshires. Mix the flour, salt and gram flour together with a whisk and gradually pour in the milk. Whisk good and hard so you can see bubbles - the airier the better. Use an electronic whisk to save your strength! The batter will be thin, this is normal. Fill the holes 1/2 way of the preheated muffin tin (be careful it is hot) Put them back in the oven and blind bake for 20mins (this is important! Keep the oven door closed once they have gone it - no peeking!) After 20 mins you can check them, but be quick if they need a bit longer as the oven needs to stay hot. 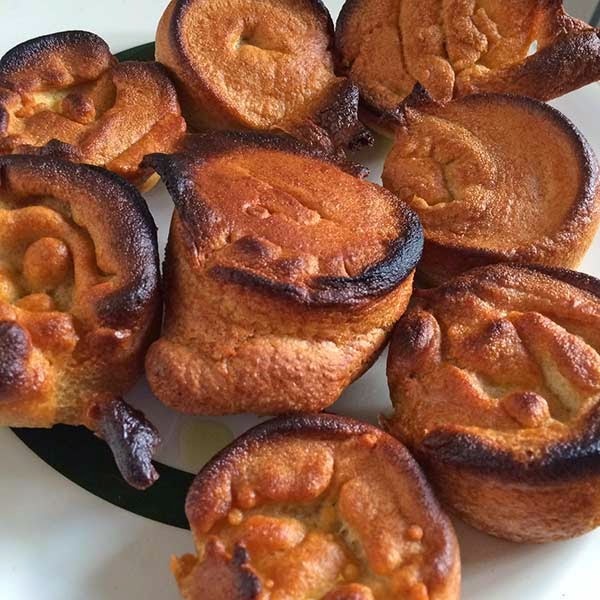 Serve and enjoy a few Yorkshire puddings with your roast once more! I had four!